Stocks: Emerging from a month-long funk? April has been a tough month for investors, with the Nasdaq taking a sharp dive and the other major markets languishing in negative territory. But U.S. stock futures were pointing higher Tuesday, lending some hope that the final days of April may make up some lost ground. U.S. stocks ended mixed Monday. Earnings continue to dominate Tuesday's agenda. Sprint (S) reported a narrower-than-expected loss and strong sales. eBay (EBAY) and Twitter (TWTR) are among the major companies reporting after the close. Share of BP (BP) nudged higher after the oil and gas firm hiked its dividend. Retailer Coach (COH) was taking a hit after the company missed sales forecast, even as it beat on earnings. Aside from earnings, shares of Nokia (NOK) surged 8% premarket after the company announced a new CEO and plans to spend billions on dividends and share buybacks. Nokia has just finalized the sale of its handset division to Microsoft (MSFT), allowing it to focus on its networks business. In economic news, the S&P/Case-Shiller home price index will be published at 9 a.m. ET. The Conference Board will publish its consumer confidence index at 10 a.m. ET. 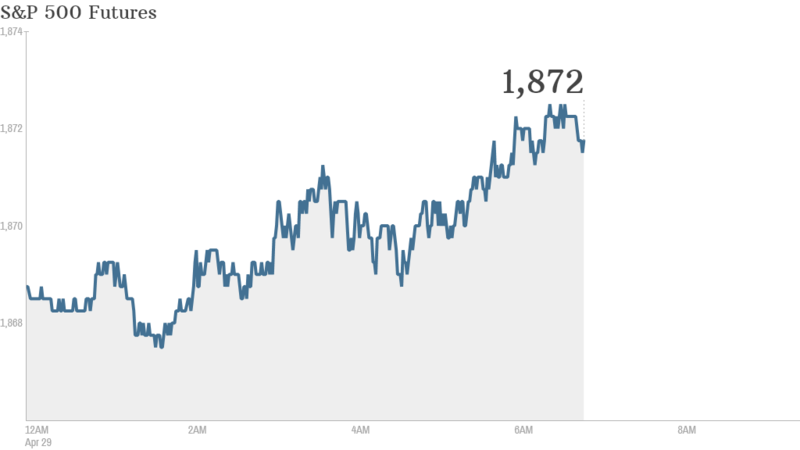 European markets were higher in morning trading. Russian stocks rose and the ruble firmed against the dollar as investors shrugged off the latest round of U.S. and EU sanctions imposed this week over the crisis in Ukraine. The British pound pushed higher, trading at its highest level against the U.S. dollar since August 2009, as GDP data showed U.K. growth accelerated to 0.8% in the first quarter. The economy grew by 3.1% during the same period a year ago. Asian markets closed mixed. The two major indexes in China logged gains, while the Nikkei in Japan declined by 1%.